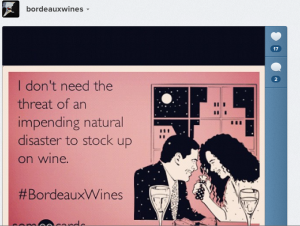 Wine Marketing in Poor Taste? With Hurricane Sandy bearing down on the Eastern Seaboard of the US it’s no surprise that folks have taken to various Social Media outlets to highlight the impending natural disaster. There were a number of “photoshopped” images doing the rounds this morning that, while not real, did provide an outpouring of support online for people who were in its path, or close to it. Later in the day we started to see a number of wine themed images appearing on our screens which seemed to us like “bandwagoning” at best and deeply insensitive at worst. 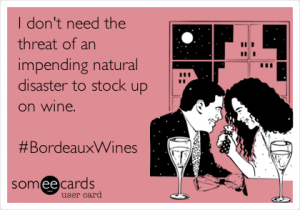 Bordeaux Wines were the first to appear on our screens with the image below on their Facebook page and also on Twitter and Instagram (although these look like the original image shot with a phone!) too, and Andrew let them know his thoughts on their image. At time of writing there has been no response from the folks running the page as we assume they are all wrapped up nice and safe in their beds, in Bordeaux!! 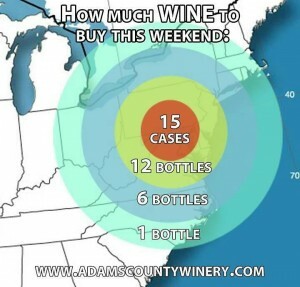 The other image that we saw today is from Adams County Winery located in Orrtanna and Gettysburg, PA. They’re close to where Sandy will come ashore so their image can probably be deemed to be more tongue in cheek but we still think that in the face of mass mandatory evacuations more sensitivity should be deployed. It’s highly likely that people will lose their lives over the next 24-48 hours along with their properties, and many will probably be left homeless for the foreseeable future as we head into the winter in a part of the world where winters can be harsh. So at 3 rock marketing we’re asking that wineries consider the human element of what they’re engaging in before they jump on the bandwagon and our thoughts are with all of the people who are affected by Hurricane Sandy. 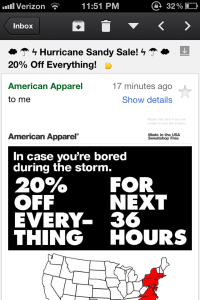 Just when you thought the images above were bad, American Apparel goes and sends and email to thousands of folks that lit up Twitter right as the storm is coming through, offering 20% Off Everything in a Hurricane Sandy Sale. As nurses take patients down 9 flights of stairs as NYU hospital is evacuated because of back up power failure American Apparel has brought shame on the marketing community.